Noble Gems Glass Menorah Ornament. Size: 4.5 inches. Judaic Ornaments and Decor by Kurt S. Adler featuring Blown Glass Ornaments Judaic, Menorah's and Jewish Themed Ornaments. Size each: 3.5 inches. Silver Jewish Star or David Ornament. Decorations and Accessories Judaica Collection by Kurt S. Adler. Set of 6 Size each: 2.25x1.5 inches. Glass Glittered Jewish Stars Ornaments. Decorations and Accessories Judaica Collection by Kurt S. Adler. 8 Days of Hanukkah Kitchen Towel. Size: 18 x 26 inches. 100% Cotton. Peking Handicraft Inc. Handcrafted quality handcrafted linens for the home, home fashions, holiday celebrations, entertaining and more. Size: 30x12 inches. 10 Light Hanukkah Star of David Light Set with 30x12 inch green lead wire and 12v 0.08A clear incandescent bulb. For INDOOR OR OUTDOOR USE. Jewish and Judaic Decor by Kurt S. Adler featuring Porcelain Judaic Themed Ornaments. Christmas Shimmer Star of David Tree Topper. Size: 12.4 x 8.1 x 2.4 inches. Judaic Decorations and Themed Holiday Decor by Kurt S. Adler. 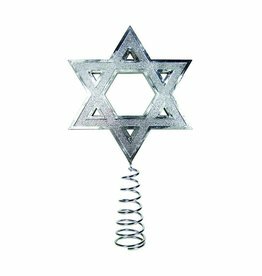 Judaic Jewish Star Tree Topper. Size: 6 inches. Judaic Decorations and Accessories Tree Toppers Collection by Kurt S. Adler. Christmas Ornament Glass Gold Menorah Noble Gems. Size: 4.5 inches.Judaica Jewish Holiday Ornaments and Decor by Kurt S. Adler featuring Blown Glass Ornaments Judaic Themed Ornaments.